MANY of the world’s financial and economic woes since 2008 began with the bursting of the biggest bubble in history. Never before had house prices risen so fast, for so long, in so many countries. Yet the bust has been much less widespread than the boom. Home prices tumbled by 34% in America from 2006 to their low point earlier this year; in Ireland they plunged by an even more painful 45% from their peak in 2007; and prices have fallen by around 15% in Spain and Denmark. But in most other countries they have dipped by less than 10%, as in Britain and Italy. In some countries, such as Australia, Canada and Sweden, prices wobbled but then surged to new highs. As a result, many property markets are still looking uncomfortably overvalued. The latest update of The Economist’s global house-price indicators shows that prices are now falling in eight of the 16 countries in the table, compared with five in late 2010. (For house prices from more countries see our website). To assess the risks of a further slump, we track two measures of valuation. The first is the price-to-income ratio, a gauge of affordability. The second is the price-to-rent ratio, which is a bit like the price-to-earnings ratio used to value companies. Just as the value of a share should reflect future profits that a company is expected to earn, house prices should reflect the expected benefits from home ownership: namely the rents earned by property investors (or those saved by owner-occupiers). If both of these measures are well above their long-term average, which we have calculated since 1975 for most countries, this could signal that property is overvalued. This raises two questions. First, since American homes now look cheap, are prices set to rebound? Average house prices are 8% undervalued relative to rents, and 22% undervalued relative to income (see chart). Prices may have reached a floor, but this is no guarantee of an imminent bounce. In Britain and Sweden in the mid-1990s, prices undershot fair value by around 35%. Prices in Britain did not really start to rise for almost four years after they bottomed. Some 4m foreclosed homes could come onto America’s market, which may hold down prices.Based on the average of the two measures, home prices are overvalued by about 25% or more in Australia, Belgium, Canada, France, New Zealand, Britain, the Netherlands, Spain and Sweden (see table). Indeed, in the first four of those countries housing looks more overvalued than it was in America at the peak of its bubble. Despite their collapse, Irish home prices are still slightly above “fair” value—partly because they were incredibly overvalued at their peak, and partly because incomes and rents have fallen sharply. In contrast, homes in America, Japan and Germany are all significantly undervalued. In the late 1990s the average house price in Germany was twice that in France; now it is 20% cheaper. The second question is whether home prices in markets that are still overvalued are likely to fall. Some economists reject our measures of overvaluation, arguing that lower interest rates justify higher prices because buyers can take out bigger mortgages. There is some truth in this, but interest rates will not always be so low. The recent jump in bond yields in some euro-area countries has raised mortgage rates for new borrowers. And low rates need to be balanced against the fact that tighter credit conditions make it harder for homebuyers to get mortgages. The average deposit needed by a British first-time buyer is now equivalent to 90% of average annual earnings, according to Capital Economics, a consultancy. It was less than 20% in the late 1990s. Another popular argument used to justify sky-high prices in countries such as Australia and Canada is that a rising population pushes up demand. But this should raise both prices and rents, leaving their ratios unchanged. Prices do not necessarily need to drop sharply to return to fair value. Adjustment could come through higher rents and wages. With low inflation, however, it could take a decade or more before price ratios return to their long-run average in some countries. American prices fell sharply, even though homes were less overvalued than they were in many other countries, because high-risk mortgages and a surge in unemployment caused distressed sales. In most other countries, lenders avoided the worst excesses of subprime lending, and unemployment rose by less, so there were fewer forced sales dragging prices down. America is also unusual in having non-recourse mortgages that let borrowers walk away with no liability. An optimist could therefore argue that our gauges overstate the extent to which house prices are overvalued, and that if markets are only a bit too expensive they can adjust gradually without a sharp fall. It is important to remember, however, that lower interest rates and rising populations were used to justify higher prices in America and Ireland before their bubbles burst so spectacularly. Another concern is that Australia, Britain, Canada, the Netherlands, New Zealand, Spain and Sweden all have even higher household-debt burdens in relation to income than America did at the peak of its bubble. Overvalued prices and large debts leave households vulnerable to a rise in unemployment or higher mortgage rates. A credit crunch or recession could cause house prices to tumble in many more countries. Just because prices have hit fair value (or nearly) does not mean that they cannot fall further. Markets tend to overshoot in both directions. In Ireland the banks have all but stopped taking on new mortgages. This means that it is impossible to get credit and the market in Ireland is turning to a cash-only one. The numbers on China are odd to me. According them, the housing price is either slightly overpriced or massively underpriced. Then why do we see so many people in China complain about expensive housing prices, and hence the long-running battle between the central government and the local governments/developers over housing price? Does everyone in China got the their numbers wrong, or does the Economist got its number wrong? Prices for real estate are extremely location sensitive; does national level data reveal anything useful? If the mortgages are relatively well-regulated and insured, would you not need to measure specifically the lower end of the market or the highly-indebted housing held to reveal more accurately what risks there are? Inflation-indexed bonds/Linkers/TIPS/real return bonds had a 'price/rent' ratio of about 20 in the mid 1990s and about 100 now, depending on country. Isn't this the same phenomenon? Just an NPV calculation. Are we sure that real interest rates are going to bounce up from their current 1% and reduce the prices of linkers, houses - oh, and equities too? And what about the cost of building where does this fit in the equation ? In many northern countries this is still quite high. Zeitgeist: you are aware that the Economist has been publishing this data regularly for years, aren't you? In this case, we must congratulate these "vested interests" for their foresight. A second thought, this data would be more meaningful if it included interest rates alongside prices. Singapore, for example, currently lends at about 1%, well below an inflation rate of about 5%. Australia, in contrast, lends at 6 to 7%. This puts prices into very different perspective. It probably does not make sense to produce a single index for a place as diverse as China. As some earlier posters have commented, country-wide data such as this can only be used as a rough guide to valuations as real estate is all about location within that market. I believe the results for the UK are significantly skewed by the London and SE England market. London has generally not seen price falls over the past 3 years and prices are still comfortably above the 2007 high. A typical two bed apartment in London will yield a net 3%-4%. Apartments in, say, the Midlands or the North West, can yield a net 5%-8% if you buy the right property. Where else currently can you obtain a relatively safe and steady 5%-8% return on your investment (more if you use modest leverage at say 50%)? I certianly don't know where, having been burned in both the equity and bond markets, as well as earning nothing in my cash deposits. For me, certain parts of the UK therefore are undervalued or at least fair value at present ("the Regions") and certian areas overvalued ("London and the SE"). The country guide is literally only that - a guide. The unbridled greed of the few has resulted in great damage to global economies and society. They say no good deed goes unpunished, and the reverse seems to have happened here. Their bad deeds have been rewarded with bailouts, blame shifting and bonuses. Property investor psychology - what's going through the bull's minds? If these people are still living in such a world of delusion, what hope is there for society. Can the 'Occupy' protests ever change the minds of people who are that sure the bubble is a myth? Let's hope we can change their outlook. For if we can't, Australia is doomed. Real estate = Fraud + land mafia + corrupt politicians + black money in India !!! It is becoming evident in several countries that this very crude comparison is inadequate to indicate whether houses are comparatively under- or over-priced. It persistently concludes that Australian houses are amongst the most over-priced in the world, but takes no account of the fact that we have the largest average houses in the world. And most are very well equipped with swimming pools, air conditioning, double garages etc. Compare this with a standard British semi-detached on a tiny plot of land and it is no wonder they look over-priced. But there is in fact an under supply of houses in Australia as builders are unable to build new homes to compete with the current low price of the average resale. So demand is exceeding supply, and whenever that happens the price goes up,not down. A much more sophisticated analysis is required, taking into account several other factors such as income tax, consumption tax and the extent to which a house is used as an alternative to savings. Then compare them to house prices in Germany and you'll be thoroughly shocked by how extremely overpriced Australai nhousing is. This is extremely useful, thanks. It would be very interesting to see a third metric on top of affordability and yield: a comparison to replacement cost. If you could show construction cost and land costs over time too, it would be very useful to see whether there is a disconnect between house prices and replacement cost. My guess would be that land prices are highly correlated to house prices, but that construction costs are relatively more static. If that is so, tracking land costs over time would also be very helpful to identify changes in 'value' and identifying 'bubbles'? The numbers on Chinese Housing price are obviously wrong. In cities like Shanghai or Beijin, an apartment with a price tag of 3 millions Chinese Yuan(about 470k USD) generates a little more than 50,000 Yuan (about 8k USD), which gives a P/E ratio of "60" (surprising!! ha~). Price to household income is no better, average annual salary in Shanghai in year 2010 is 46,757 (China Daily). It tells you a horrible truth that in Shanghai, it takes an average family with two working adults a 30-40 years' time to payback their mortgage. Now ask them why the divorce rate and suicide rate and shooting up every year in China. The measures cited (income, price) seem to rely on the assumption that the AVERAGE income somehow conveys the ability to finance a home purchase. When you average Bill Gates and my income, the average is about $1 billion. But my $25K income will not persuade a bank to finance a mortgage of any size. You can't, therefore, conclude from the U.S. comparisons that housing is undervalued. Far from it. The measures of average income to average price in the U.S. can't be used to predict undervaluation. With the huge disparity between incomes of the top 1% and the bottom 99%, an average income is meaningless. When you average Bill Gates and my income, the average would be about $1billion, but the bank is not persuaded that my $25K actual income is worthy of a mortgage. U.S. owner-occupied housing may not be as cheap as it seems. Remember that younger generations are house buyers, while older generations are house sellers. Younger generations are poorer than older generations were at the same age. They have to spend less on something. Perhaps that something is housing. Older generations can't expect younger generations to be disadvantaged, in the marketplace and in public policy, and still have them buy their stocks and houses at high prices. There may, as well, be a structural as opposed to cyclical shift going on. 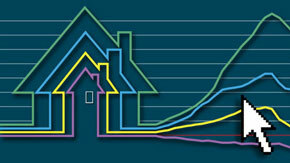 The house prices you are measuring are for owner-occupied homes in suburbs and Sunbelt cities. In the 1970s, there was a whole different housing stock -- rental housing in older central cities -- whose value had collapsed. Many such buildings were simply abandoned, even in New York City. Perhaps Sunbelt and suburban homes are now facing a similar structural shift against it. In fact, one could argue that younger generations could create more economic activity, to provide jobs for themselves, by repopulating new urban housing than by buying existing suburban housing. In many Canadian provinces rents are controlled by government policy. For example, in Ontario--responsible for 40% of Canada's GDP and population--maximum rent increases are set annually by the provincial government and they rarely exceed (the already very low) inflation. Similar laws are on the books in other provinces. This keeps rental costs artificially low compared to housing prices (which you say are 71% overvalued) since rents can only be raised to market values when a tenant leaves. Another factor, foreign investment in Vancouver's and Toronto's housing markets, puts upward pressure on house prices in those two markets which account for a disproportionately large share of Canada's housing prices. The fact that the rental market cannot readily adjust to the pressures brought to bear on the housing market by people's incomes and foreign buyers would suggest that Canada is in for a sharp house price drop. However, compared to other countries house prices aren't profoundly out of line with people's incomes (29% over valued) so does that mean that Canada's current prices are sustainable? Yes, rental prices are depressed compared to housing prices, but, but, but, when people _MOVE_ they have to pay market rates. And, given that the people (the young and recent immigrants) who are most inclined to buy houses for the first time (and don't have an existing house to sell) move around a lot, chances are they are paying closer to market rates for the rental properties so there is still an incentive for them to buy a house. Long term renters may receive some protection from having to pay market value for their rental units, but, these are the same people who wouldn't be good candidates for house purchases in the first place! In the end all the rent controls do is discourage investment in rental properties (there is a shortage), thus allowing Canada's rental stock to decline in quality (and, there is no shortage of news about landlords turning their back on the rental market and turning rental properties into condominiums or outright selling them to home buyers because it's not worth their while to stay in the rental market). One thing that should be noted is that 45% of Canadians are mortgage free. If a home is thought of as shelter and not investment, this fact alone insulates Canada from a drop in prices because we will still live in the same debt free home even when it is worth less. To us, mortgage free Canadians, a home is just that, a shelter from our bitter cold winters. Using Average Income to decide that U.S. houses are undervalued completely ignores the massive shift in wealth to the upper 2-3% of households. The middle class has had negative wage growth over the last decade and a half. Houses were ballooning in price despite this when they should have been going down all along. Like in Germany. Their middle class wages also have been under pressure form the Eastern Block. If the middle class has less money, then the price of a middle class house should fall. If it's not, someone is dicking around issuing excessive credit to create a nation of debt slaves. As this publication on November 24th is "part 2", when was part 1 published? How are these things calculated? Not to say they are wrong, but just to understand. I am from Sweden, and there housing is high compared to disposable income and to rent. But the rental market is regulated with fixed prices, and there is a huge demand and decades of queing to get any of those, that are much cheaper than what you can find on the free market, i.e., buy something. Not true for all of Sweden, but in areas as Stockholm. Is these type of regulatons taken into consideration. When it comes to disposable income, does the calculation take into consideration that you need to cover different things in different countries with your income. Again, in Scandinavian countries the tax is higher, and the disposable income lower, but no need to pay for health care, schools for kids, low cost for kindergarten etc. That makes it possible to spend a larger share of disposable income on housing. Is that taken into consideration? "We believe that Canada's housing bubble surpassed the peak of the U.S. housing bubble in 2010 when Canada's household debt to income ratio surpassed the peak of the U.S. ratio in 2010." "Cause of Housing Bubble: Massive Socialist Government Manipulation"
Your report evaluates valuation based on rent and income but it does not include the marginal cost of production which is the most important determinant of price in a market where demand exceeds supply which is the case in Australia, Canada, and other markets that you list. Can you please provide the data for this. In Australia, when you use a home loan calculator for $400,000 at 7% over 25 years the minimum repayments are $1,300 PER FORTNIGHT! You need an income of at least $45k JUST to make those minimum repayments of $34,000 per year. This is just ridiculous. Does anyone not think of how this is affecting young people in our society and the long term impacts of this? People are just not educated enough to make informed decisions and are being taken for a ride by the banks. Does no one realise that most of your repayments on a home loan at 7% are for the interest??? As shown here http://www.landpricecrash.com.au/ House prices are now on the way down and i think everyone is going to be taken back by how far they are going to fall. Vancouver is unstoppable and will never go down. Higher interest rates are required for any reduciton in Vancouver prices and the Conservative Government of Canada has assured the public this WILL not be happening. Vancouver is unstoppable. Best investment in the world that's why it's called Best Place on Earth because it IS. Can the house value issue be correlated by age? My father was in the post WWI US baby boom, and I was part of the largest cohort of the post WWII baby boom. He died in 2006 at 85, and many of his cohort have also passed away, leaving empty houses, long bought and paid for, and well maintained. My husband and I also have a house, and we also have my grandmother's house which we will move to, putting the other two on the market. Unlike our parents, many "boomers" like us are not waiting in their houses until they grow old, but are downsizing now. If "boomers" don't wait until retirement to sell their homes, aren't there extra houses coming on the market formerly owned by seniors in addition to the foreclosures and downsizing? I don't know how this is calculated, but it cannot be assumed that one generation will behave like the one that preceded it in kind of an orderly march. The last 35 years correspond to our adult working lives, so is the housing depression affected also by the movement of the peak of the baby boom through young adulthood, parenthood, and now late adulthood? Our buying patterns are not fueling the market as they once did and our grown children are just scraping by in a bad economy, so they are not picking up the slack. Multiply this over and over, and I would think that the housing market must be affected by demographic patterns, but I have never seen an article about it. I agree. This time The Economist figures are questionable and one has to wonder if there is some agenda. I have a friend who has had a very nice reasonably priced property up for sale near the coast in South Africa. In over one year he has had only ONE enquiry and no sale yet. And he is quite desperate. There are certainly demographic factors at work here. In Canada, IMHO, there were two major factors that collided and resulted in the run up in prices over the last decade. The first is that the boom echo generation is now old enough to move out of their parent's house. Think of the typical baby boomer household just 10 years ago. Husband/Wife + 2 or 3 children all living under one roof with the children approaching their early to mid 20's. Now that those children are grown up and moving out you need 4 houses to cover that family instead of one. Kid's moving out is happening at a greater rate in the last 10 years compared to the 90's when real estate was increasing with inflation. The other major factor has been interest rates and easy money. Rates having been at or near historical lows for a long time and banks were too keen to give just about anyone a mortgage. Even more troubling is that over the last decade as prices rose parents were transferring wealth to their kids so the could "get into" the market before it was too late. Personally, as a 26 year old I liked the easy living an apartment offered but feared I would never be able to buy a house if I didn't act. So I started looking in 06, bought in 07, and am now up 44%. The bank approved me for $330K but I only used half of that, I was making about $75K at the time I believe. I could have afforded more but I cannot say the same for most of my friends, I think they are 200-300 bp's away from going bankrupt due to all their variable debt. Either they keep rates low to protect these guys and have older age workers work right through retirement. Or they get the ball rolling with some rate increases and let the younger people suffer with mortage losses. Time will tell. I really wonder what made them classify Singapore and Hongkong as part of the 'Emerging Markets'. The price decline phase in Canada is barely in its' infancy stage. US is only half way through the correction. I am surprised that The Economist failed to include Brazil in its list of emerging-market countries. And yet, Brazil has one of the fastest growing real-estate markets in the world. In the more sought after neighborhoods of Sao Paulo and Rio de Janeiro, home prices have been increasing by 50% on average ANNUALLY for the last few years. In Rio, for instance, in the Zona Sul area, a one-bedroom apartment will set you back at least US$400,000. For a view of the ocean you'll have to fork out at least US$600,000. These are Paris/London/New York-like prices. Rent prices are along similar lines. These prices come in a country that sure has seen impressive GDP growth, but incomes are still a fraction of what people have in the US/UK/France, and other dimensions (safety, quality of infrastructure, ease of doing business etc.) are all much lower, and real interest rates are in the 5-6% range. There is clearly a real estate bubble at work in Brazil. The question is: when will it burst? before the World Cup (in 2014)/Olympics (in 2016) or after? In New Zealand prices in Auckland have already surpassed the 2007 peak in some suburbs, but the rest of New Zealand has already had a significant correction in prices of up to 25% in some towns. The National figures do not show that as most of the sales come from Auckland which is where over 1/3 of the population live. If there was going to be a 'crash' in Auckland it would have already happened. I can see prices in New Zealand stabliizing for a few years while rents and incomes catch up. Why are house prices so relatively low in the US compared with Australia and other western countries? The fraud committed by the few speculating at the financial houses on credit default swaps, followed by the massive bail outs by the US government of the banks, and the negative impact on the average American caused a massive loss in trust and confidence in the economic system, to the extent that people are walking away in droves from their mortgage commitments. Meanwhile you have all the politicians on the take from the rich 1% on the corporations, still sticking it to the people, and those on the right calling for more and more spending cuts which defies all the lessons of the depression. The US is in the midst of a major breakdown in the political system. Economic consequences yes, but the primary problem is political, not economic. Australia, New Zealand, Britain and so on: not so. Life goes on. Housing is the most manipulated market in the world. I wish Brasil had been included in the analyse! Will the recession total your car?